I could not find photo credit for this black and white picture. 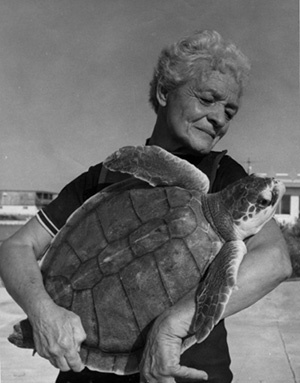 This is an interesting article that I stumbled onto yesterday about Ila Fox Loetscher who founded Sea Turtle, Inc. in 1977 after she had been rehabilitating Kemp’s Ridley sea turtles at her home for many years. ISN’T SHE ADORABLE!!! (I really need to move to the beach somewhere!) 😉 Have a great day, and give someone you love a big hug! Posted on September 18, 2014, in My Thoughts and tagged The Turtle Lady. Bookmark the permalink. Leave a comment.